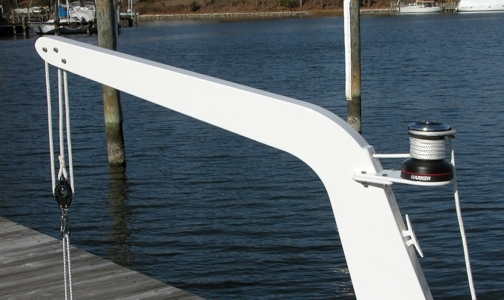 The 'VOYAGER' model is a lightweight, streamlined davit that has been designed to enhance, rather than distract from the appearance of your boat. An all-welded aluminum box construction for maximum strength and minimum weight. 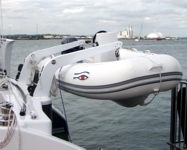 An eye pleasing streamlined shape, designed to suit any size dinghy with a six foot beam and under. 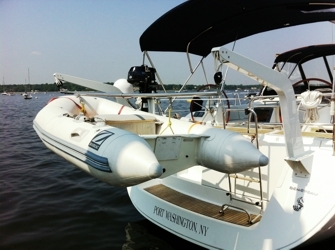 Internal 6:1 purchase system with large Harken roller bearing blocks and white 3/8" braid to make it easy on the hands. A durable Awlgrip finish in Off-White. Safe Load 420 lbs. each davit arm. 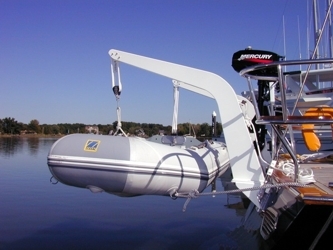 Each davit weighs only 28 pounds with tackle. 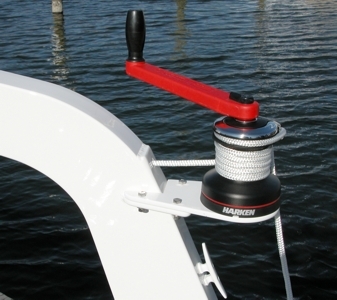 Built-in Harken cam cleats for convenience when hoisting. 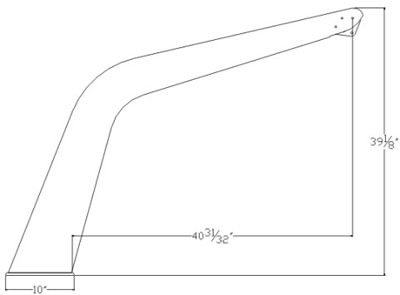 An additional 10" can be added to the height to make up for mounting low (eg.on a step etc.) Price:	$930.00/pr. This is a 'wrapped' coaming base with a welded gusset. This may be desired when there is not quite enough room to accomodate the Voyager's 10" base Price:	$970.00/pr. 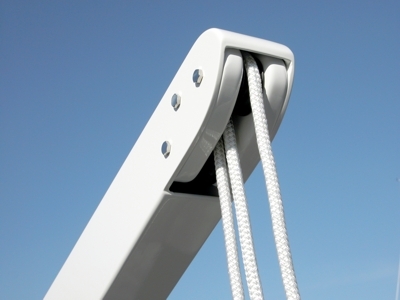 Custom designed to suit the intended vessel's transom they provide a mounting platform for the Voyager davits. 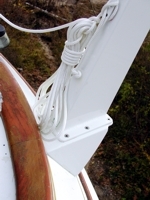 Used when mounting on deck is not practicle. Price:	$1320.00/pr.